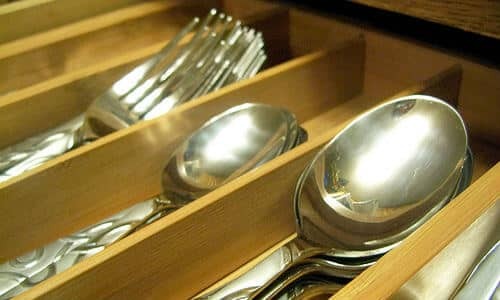 Keeping my everyday silverware handy is something that I like to do, and with a decorative silverware caddy I can keep it on the table or bring it outside for picnics. This works so well for me because I can keep my nicer silver flatware packed away for special occasions and easily reach for my everyday set. There was a silver platter that I had purchased several years ago and used it all this while for my everyday flatware. At most times I would keep a napkin or vintage linen inside it, however it would get dirty so fast it wasn’t worth doing. Now I have decided to change to burlap since its so much in fashion along with it being inexpensive. I placed the burlap inside the container and gathered the excess in the front of the container. I used a rubber band or a ponytail holder to tie the burlap after putting it together. Use a nice ribbon over the rubber band to cover it. In fact putting an embellishment over the ribbon might be a good idea, you could use anything from a brooch to a flower. The flower can be poked through the burlap and flipped out of the back such that it is secured. Not only does this entire concoction provide a great look, it works out to be rather inexpensive and easy too. It looks like a rather smart and chic flatware caddy. Despite it being cloth, you can change it often too if it gets dirty. In fact it would be a great way to decorate it and present it to someone special!